Brilliant deep purple color. Sweet, candied aromas of cherry syrup, raspberry pez candy, creme de cassis, and chocolate covered coconut macaroon with a round, crisp, effervescent, sweet medium-to-full body and an interesting, medium-length chocolate yogurt and aged rum daiquiri finish. A fruit-basket of berry flavors prevails in this rich and sweet sparkler. Bottom Line: A fruit-basket of berry flavors prevails in this rich and sweet sparkler. 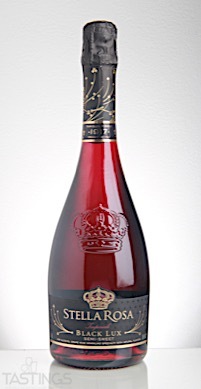 Stella Rosa NV Imperiale Black Lux Sparkling Wine, Italy rating was calculated by tastings.com to be 88 points out of 100 on 7/14/2017. Please note that MSRP may have changed since the date of our review.